Encyclopædia Britannica, founded in 1768, has been serving knowledge seekers around the world for 250 years. To commemorate this milestone we’re publishing the Encyclopædia Britannica Anniversary Edition: 250 Years of Excellence (1768-2018). This is the last ever Book of the Year that we will be publishing, so don’t miss out on this historic event! Designed both to complete your Britannica yearbook collection and to serve as an engaging stand-alone volume, this individually numbered, special collector’s publication is a rare compendium of knowledge, insights, and history and will be the last edition in the 80-year tradition of Britannica’s distinguished yearbooks. 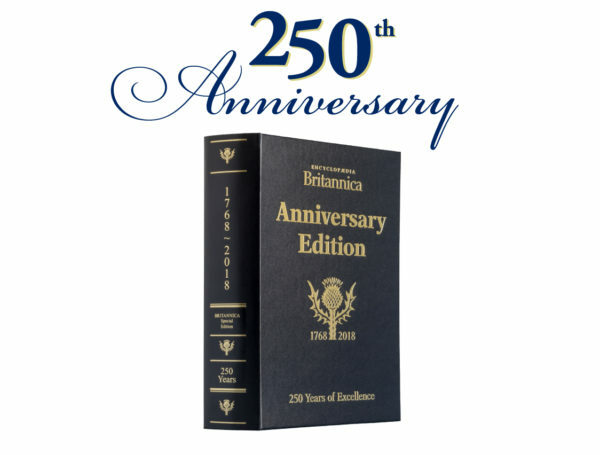 Order this Collector’s edition today for just £75 and you will automatically receive free personal access to Britannica’s Online Premium Service for one year. Enjoy some of our favourite entries from Britannica’s earliest editions, going back to 1768, when Britannica wondered whether “Callifornia” was an island. Enjoy the words of the great contributors who have written for Britannica over the centuries, including Albert Einstein, Marie Curie, Neil deGrasse Tyson, and Arnold Palmer. Martin Scorcese talks on film preservation, The Archbishop of Canterbury discusses Christendom, E.O.Wilson writes about mass extinctions and many other contributors discuss the modern world.